St. Cecilia is said to have heard heavenly music inside her heart when she was forced to marry the pagan, Valerian. A wealth of music, art and festivals in honor of St. Cecilia has grown from this little bit of information from her biography. She is the acclaimed patron saint of music, especially church music, as well as that of musicians, composers, instrument makers and poets. 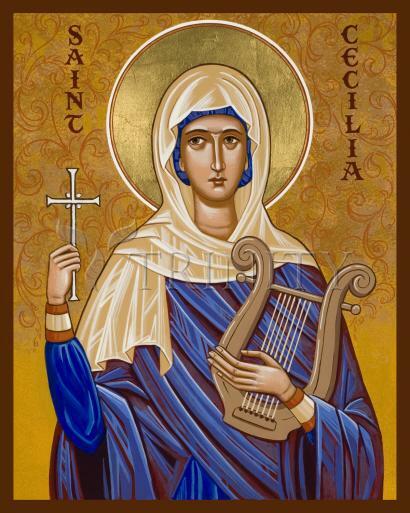 The name Cecilia means blind and so, although we don't know if she herself couldn't see, she is also the Catholic patron saint of the blind. St. Cecilia's following flourished during the Middle Ages in Europe. Songs were sung in her name, poetry was written, paintings with St. Cecilia as the subject were created, and her feast day, on November 22 was happily celebrated. She continued to be a popular topic for the arts well into the 18th century. Hans Memling, in 1470, painted St. Cecilia playing the organ at the mystical marriage of Catherine of Alexandria. In 1584 she was named patroness of the academy of music founded in Rome. Raphael painted her at Bologna, Rubens at Berlin and Domenichino in Paris. Chaucer commemorates her in his Second Nun's Tale and Handel set John Dryden's "Ode to Saint Ceclia" to music in 1736. Never was so much made of such a tiny bit of pseudo-biographical information. St. Cecilia, said to have heard heavenly music at one moment of her life, became the patroness of all western music.